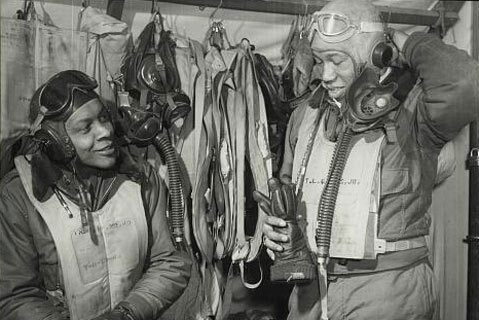 Army Air Corp pilots William A. Campbell (left) and Thurston L. Gaines Jr. in Ramitelli, Italy, in March 1945. David Campbell is immersed in another college basketball season, his 11th as part of the UCSB men’s staff. A valued perk of his job is the opportunity to attend the NCAA Final Four, slated this year in New Orleans. But, as he has for the past five years, Campbell will instead go to Phoenix, Arizona, and visit his father, Colonel William A. Campbell, one of the black World War II fighter pilots whose exploits are portrayed in the movie Red Tails. Campbell is glad the movie came out, even though his father — 96 years old and residing in an Alzheimer’s care facility — is past enjoying it. Just as his father used to watch him play basketball at St. Mary’s College, Campbell now has seen a vivid depiction of the serious games his father played as a young man in the skies over Europe. William Campbell was a 1937 graduate of the Tuskegee Institute of Alabama, where the Army established a base for the training of black pilots. He was first in line and went into combat on a raid over the island of Pantelleria in June of 1943. “My father was the first black pilot to drop a bomb in the war,” Campbell said. Later, his father became commander of the 99th Fighter Squadron, escorting bombers to enemy targets out of Italy. He flew 106 missions during the war. The younger Campbell said he was “an Air Force brat” growing up. He was born in Tuskegee and spent the first 15 years of his life moving around the country and to Turkey as his father’s deployments dictated, until the colonel retired to Monterey in 1972. “When I was 10, my brothers and I started going to Tuskegee Airmen conventions every year,” Campbell said. It was then that he started to realize his father’s place in history. His brother Steve went to the Air Force Academy and flew F-15s, the most advanced fighter jets. He is now a Southwest Airlines pilot. David Campbell joined Bob Williams’s UCSB basketball staff in 2001. He is the director of internal operations and academics for the men’s team. There is another connection between Gaucho basketball and the Tuskegee Airmen — Lowell Steward, a UCSB Hall of Fame athlete, flew 46 combat missions with the Red Tails in 1944-45. He and William Campbell are among 30 — out of 340 such pilots — who are still alive. Sixty-six were killed in action or accidents during the war. Steward, who will turn 93 this month, lives in Oxnard. He is quite taciturn in his old age, but when he attended a premiere showing of Red Tails in Los Angeles, “His eyes opened wide, and he stayed awake and alert the whole time,” his daughter Pamela Mills said. Steward was captain of the Gaucho basketball team in 1941, but he was banned from playing in the National Association of Intercollegiate Basketball Tournament because of segregation in Kansas City. He faced further discrimination when he tried to enlist in the Armed Forces after Pearl Harbor; all his teammates were accepted, but he was not. After graduating in 1942, he enlisted in the Army Air Corps because, in his words, “They said black people couldn’t fly. I said I know that’s not true, and I joined up to prove it.” He made it to Tuskegee in time to prove it. 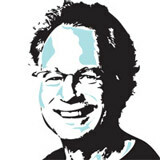 For more on Lowell Steward, visit independent.com/lowellsteward.